With the season of summer blockbusters coming to a close, it seems like the perfect time to have a gritty mystery with an ensemble cast released. “Prisoners” is the story of a father (Hugh Jackman) who will stop at nothing to find his kidnapped daughter and the detective (Jake Gyllenhaal) who never leaves a case unsolved investigating her disappearance. Combined with a love for a good mystery, the film’s themes of family and desperate measures had my appetite properly whetted after viewing the trailer months ago. Although I probably could’ve done a better job of reining in my expectations going in, “Prisoners” managed to exceed them even at such an inflated level. After sharing a Thanksgiving meal together, two families are torn apart when each of their daughters vanish without much of a trace. The only clue to the identity of the girls’ captor is a creepy RV belonging to a mentally-challenged young man (Paul Dano). When the leads start to turn cold, Keller Dover (Jackman) decides to take matters into his own hands. From one view of the trailer, you can tell this is an ensemble piece. On top of the names already listed there’s Oscar winner Melissa Leo, Oscar nominees Terrence Howard and Viola Davis and Golden Globe nominee Maria Bello. It’s not uncommon for a cast of actors like that to cancel each other out in this type of film. After all, if everyone stands out then no one really stands out. 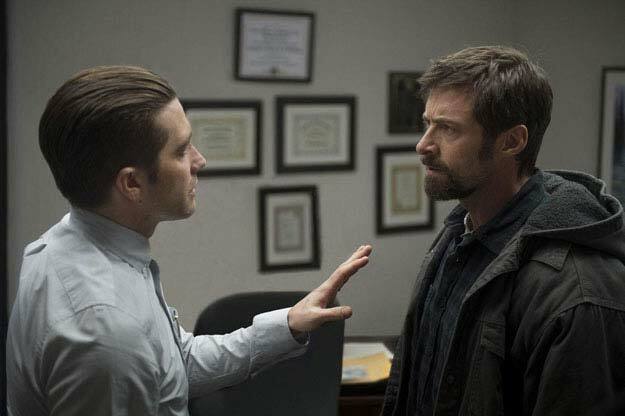 Fortunately “Prisoners” centers around the characters played by Jackman and Gyllenhaal and both actors arguably give the performance of their careers. Though it comes across as more of a drama, at the center of the film is the search for two missing girls. As leads develop into the pursuit of suspects, there are a few thrilling sequences reminiscent of films like “Zodiac” or “Se7en.” Along with some exciting scenes, the film itself takes a few twists and turns that will keep the audience guessing til the whistle blows at the end. There really isn’t much I can say negatively about the film, but the performances by Jackman and Gyllenhaal and the story itself are clearly its strongest qualities. Jackman in particular shows a full range of emotions as the father of a missing girl who resorts to torturing suspects for the truth. The scenes between him and Paul Dano are downright chilling at times. Even though it’s obvious that what we are seeing is wrong, the audience still has to question how much differently they would act in such a horrible situation. Despite being hoodwinked into appearing in “Movie 43,” Hugh Jackman is on quite the roll right now. “Prisoners” is a dark thriller that is very well put together and, as it currently stands, is my choice for film of the year. Considering the fact it’s only September that title could change 10 times between now and January, but “Prisoners” is suspenseful, challenging and a complete joy to watch after such a mediocre 2013. Later this week I’ll post my review of the indie film “In a World…” written and directed by (and starring) Lake Bell. Happy viewing. What is it about the 3rd movie of a franchise? Does all the fun run out when the credits roll for the 2nd film? Whatever the case, “Riddick” joins a long line of other sequels that leave much to be desired. After being double-crossed by his Necromonger pals, Riddick (Vin Diesel) is marooned on a deserted planet and left for dead. Feeling that he’s lost a step, he returns to life in the wild in order to regain his psychopathic charm audiences experienced in “Pitch Black.” After setting off a beacon that informs mercenaries of his whereabouts, Riddick has to outsmart and outlast the contract killers before the planet’s native predators take them all out. The Riddick trilogy (only counting live-action films) follows a strange trajectory. The first film, “Pitch Black,” is kind of a science fiction/horror film where a band of crash survivors try to find a way off a planet before a solar eclipse makes them an alien entree. Then “Chronicles of Riddick” goes in a COMPLETELY different direction making Riddick an action star in a film that does some crazy world-building and introduces a galactic enemy known as the Necromongers. Now, this film tries to scale back all the work done by its predecessor to create a bare bones tale that will (hopefully) bring the Riddick story to a conclusion in a later film. The story goes that Vin Diesel actually used his house as collateral in order to finance this film. I love him for that, but really wish he had been able to create a better project here. Because of the box office disaster known as “Chronicles of Riddick”, companies weren’t exactly chomping at the bit to lose millions of dollars. Being the nice guy that he is, Diesel decided to make the film happen any way possible, just for the fans. The first half-hour of the film is rather slow and plodding. Writer/director David Twohy basically writes out the Necromonger storyline quicker than you can say “You keep what you kill” and we are left with Diesel just hanging out with himself for a solid 25 minutes. During this time, he decides to gain his killer instict back by making a pet of one of the planet’s scavengers (pictured above). Even though this first act is a little hard to enjoy, it would be perfectly acceptable if the film didn’t ruin all of its suspense by unveiling the main monsters in broad daylight 20-30 minutes into the film. Part of what made “Pitch Black” an effective film was that the monsters lurked in the shadows and weren’t fully seen until about 2/3 of the way through the film. The lack of suspense this film has is like comparing the original “Halloween” to Rob Zombie’s misguided remake. Don’t hear me wrong. I’m not saying this should have been a rip-off of “Pitch Black” or a straight horror film, but revealing these monsters the way “Riddick” does makes them completely un-scary. After Riddick sets off the beacon and the mercenaries show up, get ready for some trashy B-movie acting and dialogue. Almost every character is cannon fodder (or Riddick fodder, rather) or a total caricature. Jordi Molla, looking exactly the same as he did in 2003’s “Bad Boys II”, plays the leader of the mercs and is immediately unlikeable (probably on purpose, but man is it oversold). Wrestler Dave Bautista actually does well with his role as one of the hitmen, not that it’s too tough of a gig. The only one of these dozen-or-so characters who is even memorable is a sniper named Dahl, played by the one and only Katee Sackhoff. Best known as Starbuck from “Battlestar Galactica,” Sackhoff takes her tough girl attitude and witty humor to the big screen and pulls off the character nicely. If you’re going to see the film for Riddick vs. monsters, you will be disappointed. There is no confrontation between Riddick/mercenaries and the aliens until 90 minutes into the film. Some of the action is good here, but it’s too little, too late. I will also say that the creature design is pretty interesting, but with this film’s limited budget, there’s something left to be desired there. At this point, I know I’m coming off a bit harsh on the film. It’s the ones you love that hurt you the most and I am a big fan of this franchise. Earlier this year I was also burnt by the latest Die Hard film, but that was a much bigger fall from grace than what we have here. “Riddick” is a disappoinment in many ways but I’m glad we were able to see the character on the big screen again. Hopefully we get some resolution before Vin Diesel gets too old (He’s 46!!!) for the part. Oops. Forgot I had a blog there for a minute. One of my favorite comedies of the last decade was the Edgar Wright/Simon Pegg/Nick Frost collaboration “Hot Fuzz” and their other film, “Shaun of the Dead”, is recognized as a cult hit. Needless to say, there was some anticipation on my end for what was promised to be the final chapter of this little trilogy. “The World’s End” teams up director Wright and the Pegg/Frost duo with other talented actors like Martin Freeman, Rosamund Pike, Eddie Marsan and Paddy Considine to deliver their unique take on sci-fi invasion films. Pegg plays Gary King, a washed-up juvenile delinquent still living off of past glory who decides to round up his childhood friends for a night tearing up their hometown. Years ago, the pack (Pegg, Frost, Considine, Marsan and Freeman) attempted a drinking challenge known as the Golden Mile (12 pints in 12 pubs) but failed. After some scheming and manipulation, King is able to convince his reluctant former friends to give it another go. As if the reunion weren’t awkward enough, the boys stumble upon an “Invasion of the Body Snatchers”-type scenario after noticing many odd changes to their hometown. The premise may seem a bit odd, but this group has done a great job with their past two films of making the laughs work with other elements of the story. Here they manage to weave an interesting sci-fi tale with some of the year’s best comedic material. I’m not sure I can say it’s funnier than “Hot Fuzz” for me, but the film is easily one of the year’s best. Since its creators have such a passion for what they are doing, fans of the series can find all kinds of nods to previous films and inside jokes. However, if you’re not familiar with “Shaun of the Dead” or “Hot Fuzz”, the film will still make perfect sense to you. It would be easy for a film like this to rest solely on its jokes and space invaders twist, but there is real character development for each member of the drinking crew. While all five of the men provide admirable performances, Simon Pegg really shines through with a strong showing. I honestly wouldn’t be shocked by his name being in the mix for a Golden Globe nomination. One of the only negative things about the film is that it requires a bit of strained faith to understand the progression of the plot. Even after the group discovers the secret of the town, they decide to continue their pub crawl in order to keep up appearances. This is one of a few instances where “drunk logic” keeps the plot moving. The only other thing to point out is that the film’s ending feels a little bit underwhelming at first viewing. Given more time to think about it, it’s not too big of a problem though. On top of its quality science fiction and great dialogue, there is a lot of heart in “The World’s End”. As the characters mature and the story progresses, the film has a good bit to say about addiction, friendship and a few other topics that might appeal to audiences. After a summer of lackluster popcorn movies, this is a film that truly entertains. Next up for review is “Riddick”, the third live-action film of the Vin Diesel series. Hoping it’s good since I’ve waited through many Fast and Furious movies for Diesel to return to the role.